With the inexorable rise of the curbside kimchee taco, not to mention the advent of the bulgogi burger, it was only a matter of time before the Underground Gourmet came face-to-face with the Korean slider. The encounter took place a few weeks back, at Danji in Hellâ€™s Kitchen, which boasts not just one but two Korean-inflected mini-sandwichesâ€”both as addictive as the White Castle archetype, though unavailable by the sack (at least for now). These compulsively edible super-sliders happen to be the stars of a savvy small-plates menu that channels the strong, pungent flavors of Â­Korean cuisine into forms recognizable and accessible enough not to alienate the mainstream, but compelling enough to stand out in a dining world pretty much up to its eyeballs in small plates. Credit for this goes to chef-owner Hooni Kim, a Korean-American who grew up in New York and cooked at Daniel and Masa. Like many a classically trained chef before him, Kim has forsaken the fine-dining circuit to cook his own food in humbler surroundingsâ€”these, gracefully outfitted in whitewashed brick and dining-room tables equipped with handy drawers for stowing away menus. 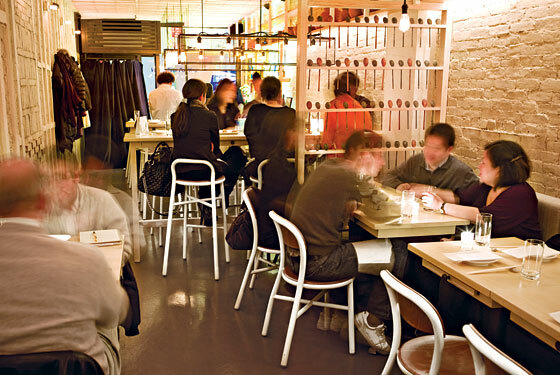 Although there is a contemporary feel to the 36-seat space, and a boisterous bar scene fueled by Milkis-soda cocktails and the unfiltered rice wine makgeolli, the design integrates tokens of traditional Korean culture, like metal spoons fashioned into space dividers, and clay pots, or danji, displayed on high shelves. That juxtaposition of old and new is true of Danjiâ€™s bifurcated menu, too, which offers a selection of shareable courses that the chef divides into â€œtraditionalâ€ and â€œmodernâ€ categories, a distinction that tends to blur as one happily grazes through it. Start with a kimchee sampler of sorts, a trio of daikon, napa cabbage, and daikon leaves whose production Chef Kim farms out to his mother-in-law. Itâ€™s cool and invigorating and served on a long, white rectangular plateâ€”more haute than homey, as is the presentation in general. Soup-stews served in teacups are good appetite-whetters, too: Butternut squash â€œcongeeâ€ is a riceless purÃ©e, save the morsels of mochi suspended inside like chewy croutons, while the miso beef stew is bolstered with daikon and a hunk of tofu that jiggles like a bobblehead doll in a strong wind. There are dishes served raw (a ruby-red steak tartare, a yellowÂ­tail sashimi) and languorously cooked (short ribs braised in soy, sake, and mirin, a sublime piece of poached sablefish on a disk of soft daikon). Of the starches, we prefer the modern â€œpaellaâ€ over the traditional japchae: Imagine a bibimbap concocted by a talented Spaniard and you get the idea. The rice is mingled with kimchee and cubes of bacon and chorizo, then crisped over a sizzling platter and topped with an optional (and recommended) fried egg. Itâ€™s a joy, especially for fans of soccarat, the crusty rice that sticks to the pan. In the meat department, miso-glazed lamb chops and grilled pork belly with tofu are fine but canâ€™t really compare to the Â­Korean-barbecue-style skirt steak, with its deep flavor, tender-chewy texture, and lovely char. It would seem, considering the good Thai-style chicken wings, the better Korean fried chicken wings, and the tender fried calamari with a mild wasabi mayo, that the chef has, if not a death wish for his customers, a healthy appreciation for bar food. Of all the artery cloggers, though, our favorite was the deep-fried tofu, creamy with just a bit of chew, garnished with scallion and ginger and blitzed with tempura crumbs for extra crunch. And speaking of bar food, letâ€™s return to those sliders, which come two to an order. The â€œbulgogi filet mignonâ€ renditionâ€”garnished with a kimchee cucumber, slivered scallions, and Sriracha mayoâ€”is like a Korean-inspired improvement on a Philly cheesesteak, if such a thing is possible. The richer pork-Â­belly version has more heat and depth, thanks in part to a smear of gochujang, the Korean hot-pepper paste made with fermented soybeans. Both are served on squishy butter-grilled buns as soft and golden as toasted marshmallows, and might be the best mini-sandwiches in midtownâ€”modern, traditional, or otherwise. Hours: Dinner Monday through Thursday 5:30 to 11 p.m.; Friday and Saturday until midnight. Lunch Monday through Friday noon to 3 p.m.
Prices: Small plates, $5 to $18. Ideal Meal (for two): Kimchee, â€œpaella,â€ sablefish, tofu, skirt steak, sliders. Note: Dessert is from Paris Baguette; try the not-too-sweet sweet-potato cake. Scratchpad: One star for the concept; two for the cooking, the artful plating, and the cheerful service; plus a bonus star for the sliders.